The properties of organic materials in thin films and at interfaces strongly depend on the way the (macro)molecules organize at the supramolecular level. This particularly applies to conjugated molecular/polymer compounds, as their optical and electronic properties in the solid state are deeply affected by intermolecular interactions. 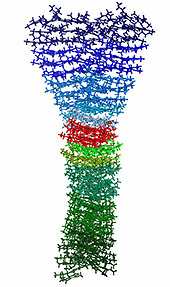 Supramolecular organization is also a major issue in polymer-based nanocomposite materials and for the generation of functional (chiral) nanostructures.For these studies, we use a joint experimental/modeling approach that combines scanning probe microscopy and force-field molecular modeling. The microscopic techniques (mostly Atomic Force Microscopy and related techniques) are used to determine the morphology of the thin films on the nanoscale and the results are interpreted with the help of simulations of the supramolecular assembly.